Cascade Brewing released Sang Rouge 2015 in 750-ml bottles and on draft this week. It will be made available through Cascade Brewing’s worldwide distribution channels, as well as at its two Portland pubs. This is exciting because it’s returning to the market after three years away and coming back with double the draft output. Iron Hill Brewery & Restaurant ushers in 2018 with the release of three canned offerings within a few months, all vividly designed and creatively packaged in 16-oz cans, bringing ever more of the scratch brewery’s popular beers and expanding portfolio into conveniently portable packaging. The winter 2018 lineup rolls out this week with the release of cult favorite, Rising Sun: a single-hopped IPA with the intensely tropical Sorachi Ace. For the first time in the brewery’s 21-year history, Iron Hill will place year-round emphasis on their canning program by releasing at least one canned beer every month. Rising Sun will be the first canned offering in 2018, followed by Bedotter (February 8) and Ore House IPA (February 22), with more fresh beer coming out throughout the year. All three cans will feature fun new designs from Pittsburgh’s Smith Brothers Agency, the latest in an ongoing series of collaborations between the brewery and the firm, including other favorites such as Crusher, Mahalo, Apollo!, Vienna Red Lager, Pig Iron Porter, Pumpkin Ale and Oktoberfest. The Rising Sun can embraces the Japanese Sorachi Ace recipe and was inspired by the iconic Japanese woodblock prints from the 1800s. The sun evokes the lightness of the liquid inside, with the crashing wave representing a slight hop kick. Together, the symbols show how perfectly balanced the beer is. On Saturday, Jan. 20, Braxton Labs will release a Bourbon Barrel Aged Oatmeal Stout, its first barrel-aged beer in bottles, infused with Carabello Coffee Tandem Espresso. The 11.7-percent ABV beer will be available in 500-ml bottles beginning at 11 a.m. This project was intended to highlight the collaborative environment in Braxton’s local Northern Kentucky community. The beer spent six months aging in freshly dumped New Riff OKI Bourbon barrels. New Riff is Braxton Labs neighbor in Newport, Ky. Opened in 2014, New Riff’s story is a new take on the old, bringing new energy and influence to the Kentucky bourbon landscape. After aging in the OKI Bourbon Barrels, the beer continued its local journey by being infused with 2 lbs per barrel of Carabello Coffee Tandem Espresso beans. The bold coffee flavor complements the notes of vanilla, chocolate and oak. The Espresso beans were sourced and roasted by Carabello Coffee in Newport, Ky.
Whirling Dervish, Monday Night Brewing’s newest seasonal release, is a classic dry Irish Stout with coffee roasted from long-time local partners Batdorf & Bronson. It clocks in at 4.9-percent ABV. Whirling Dervish can be enjoyed on its own, but as a dry Irish stout, it pairs well with oysters, beef stew, grilled meats … and even vanilla ice cream. Look for Whirling Dervish in Georgia and Alabama markets by the end of January. Schlafly Beer just released Northeast India Pale Ale, the first beer in its 2018’s Hop Allocation Series, which we are super excited about. Part of the collection that features different hop-forward beers throughout the year, the Northeast IPA (8 percent, 35 IBUs) is a new brew for the line. Schlafly Beer’s take on the ever-growing popular style is a fresh, bold, unfiltered beer. Its bouquet of hops forges a true, welcoming flavor to the beer’s fruity aroma and juicy finish. 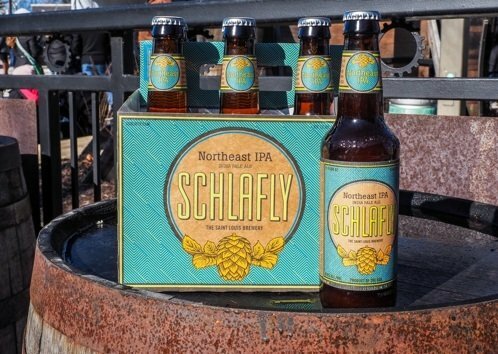 Schlafly’s Northeast IPA can be purchased on draft or in six-packs of bottles at the Bottleworks or Tap Room locations. The six-packs will also be available across Schlafly’s distribution region ($9.99) as well as on draft at select on-premise locations.